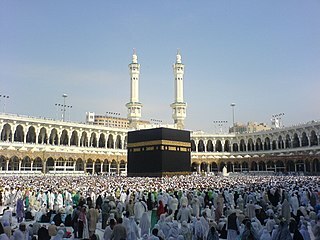 A picture of people performing 'en:Tawaf' (circumambulating) the en:Kaaba. 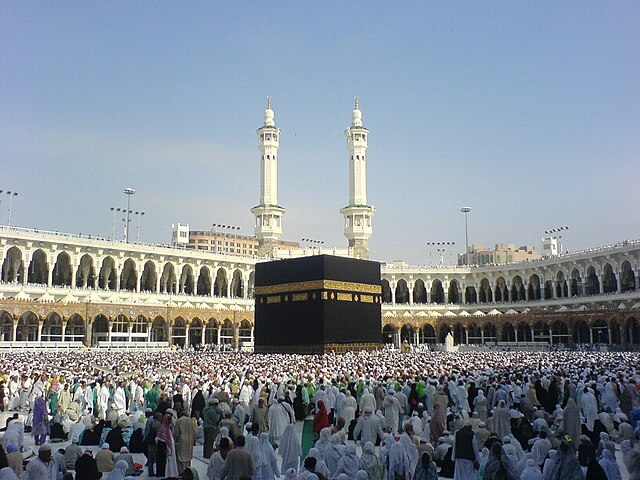 This picture taken from the gate of en:Abdul Aziz seems to divide the Kaaba and the minarets into mirror images of one another. CC-LAYOUT; CC-BY-SA-3.0,2.5,2.0,1.0; Released under the GNU Free Documentation License. 2007-09-03 17:09 Muhammad Mahdi Karim 1632×1224×8 (432270 bytes) A picture of people performing 'Tawaf' (circumbulating) the [[Kaaba]]. This picture taken from the gate of Abdul Aziz seems to divide the Kaaba and the minarets into mirror images of one another.